Paint Mexico City was filled with so many great moments, that it is hard to hunker down and write a recap. It's just going to have to be done in installments, like Judy and Katie did. 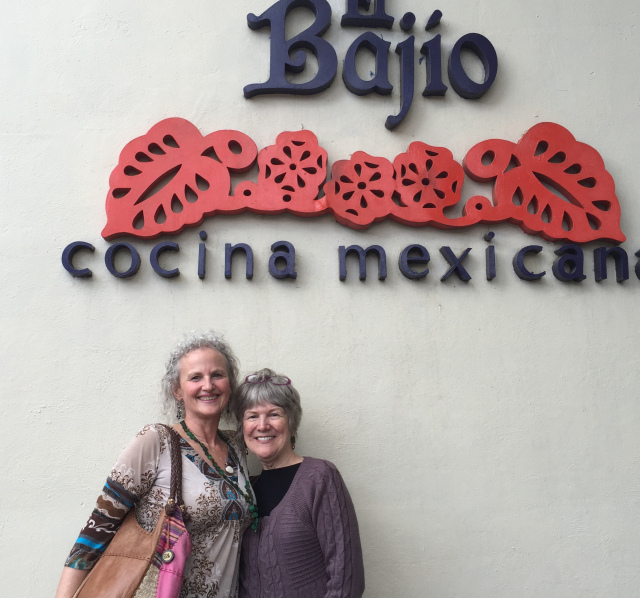 As usual, the staff arrived early so that we could buy supplies, get the lay of the land and introduce Katie and Judy to the Red Tree House and the Condesa neighborhood. After Ane Elena and I dragged them around buying supplies, we were dropped off at El Bajio, one of our favorite restaurants for comida. This was the calm before the storm. Ane Elena told us that the Modern Art Museum was just across the street......well that street ran the length of the huge Chapultepec Park (similar in size as Central Park in NYC) so Katie and Judy got a preview of some of the places we were going to visit later in the week. We certainly earned our 10,000 steps on Fitbit that day! And like NYC, some of the cabs we attempted to climb into said that they wouldn't take us to Condesa, we assumed because of the Friday night traffic, so we walked, again. With a little help from a few very kind strangers, we made it back to Condesa, to familiar territory. We celebrated getting back to the neighborhood by imbibing in a delicious mezcal margarita at a local bar near our home away from home, the Red Tree House. The following day we went to the Saturday market in San Angel. It was cold and rainy but we managed to spend a few pesos. We visited the Centro Cultural Isidro, a former municipal palace now filled with art. You were not supposed to take pictures, but I had already taken a few before we were told to "alto." Before our group of lovely artists arrived, Katie and Judy shared their special gifts that they made for our group. I love traveling with these two and being part of their sharing their talents with other artists.